To describe the technical characteristics of fatal diving mishaps and to elucidate the causes of death using a sequence analysis and a multidisciplinary investigation of diving-related fatalities. All cases of diving deaths recorded on the coast of Girona (Spain) between January 2009 and May 2018 were analyzed. Most data were obtained from the police technical reports and the forensic pathology service. Each accident was analyzed in order to identify the trigger, disabling agent, disabling injury, and cause of death. During the study period 25 diving-related fatalities were recorded. Most of the victims were males aged 50–69 years, and 11 were experienced divers. Almost all victims were using open-circuit SCUBA to breathe with compressed air as their sole gas supply. None of the victims were diving alone. The most common identified triggers included exertion, panic, buoyancy problems, disorientation and confusion. The main factors identified as disabling agents were rapid ascent, a cardiac incident, panic and entrapment. Asphyxia, lung over expansion, and myocardial ischemia were the most frequent disabling injuries. Finally, drowning represented the main cause of death, followed by arterial gas embolism and natural causes or internal diseases. 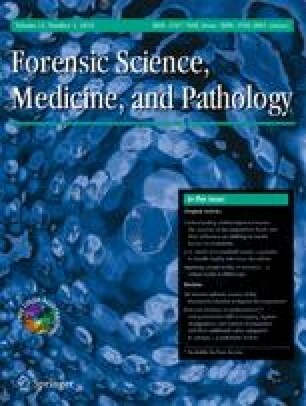 A differential diagnosis, performed in the setting of a multidisciplinary investigation, is essential for elucidating the cause of death in diving-related fatalities. The proposed sequence analysis allows to clarify underlying problems in these cases and to identify risk factors and unsafe behaviors in diving. We gratefully acknowledge our colleagues and technical staff at the Institute of Legal Medicine and Forensic Sciences for their contribution and assistance during autopsies. The authors also thank i2e3 Biomedical Research Institute for editing the final version of the manuscript and Agency for Management of University and Research Grants-AGAUR, Generalitat of Catalonia for your support (Grant number 2017 SGR 1279). All procedures performed in studies involving human participants were in accordance with the ethical standards of the Institutional Research Committee and with the 1964 Helsinki Declaration and its later amendments, or comparable ethical standards. Buzzacott P, editor. DAN annual diving report, 2016 Edition: a report on 2014 data on diving fatalities, injuries, and incidents. Durham (NC): divers alert Network; 2016. http://www.ncbi.nlm.nih.gov/books/NBK424394/. Accessed 11 Dec 2018. Buzzacott P, editor. DAN annual diving report, 2017 edition: a report on 2015 diving fatalities, injuries, and incidents. Durham (NC): divers alert Network; 2017. http://www.ncbi.nlm.nih.gov/books/NBK487739/. Accessed 11 Dec 2018.